I watched Jason Klass' video on this stove and took interest. 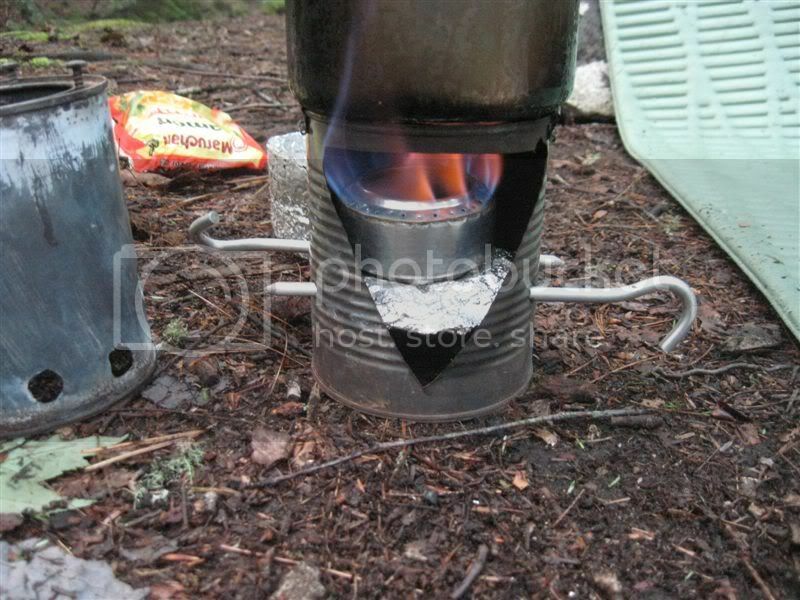 I had past experience with a Zip stove. I used one for a year off and on. I just paid 3.95 for a 110 gram canister of snow peak gas. Denatured was 10.00 a gallon at the paint store last time I bought it and I'm sure it has gone up now. White gas stoves are too heavy and smelly. Esbit is EXPENSIVE and it smells. It costs 25.00 just to drive to the trailhead. I have curtailed my driving and only go to the places that are close and reasonable. So I went out to the shop and whipped up a mock of the wood burning stove. I had a quart paint can and a food can. The drill bits were out there too. I found four screws and my wife loaned me the big paper clip things for pot supports. (She thought she was gonna get 'em back, ha). I watched the video and paused it a few times to get some specs. It took longer to watch the video than it did to make the stove. I tested it and was surprised at how welll it worked. And it fits perfectly inside my snowpeak 900. I made a pu coated bag for it so that it would not stink up the inside of my pot when stored. Then I took it this weekend. Wood was dry on Friday night and it did great. No limit to the amount of water I could boil - fuel was everywhere. I was at a well used site, but all that small wood that no one bothers to pick up is what I was after - and it was everywhere. It rained hard on Friday night and into Saturday morning. To speed things up and avoid soaked wood, I just used the alcohol stove that I brought as a backup for breakfast and it performed well (not the best pot for this stove). Saturday night the wood was still damp, but with some petroleum based cotton balls I easily got the stove burning. Once it is going there is no effort - even with damp wood. 2 problems I had --The pot supports did not work at all - they did not clamp hard enough to support a pot of water - I will change this. The alc stove supports should be well thought out - height is important. nice job hooty should work well in campground areas where there is plenty of small wood but not enough for their large firepits. You did a good job, what don't you like about it? PEPPER SPRAY AIN'T BRAINS IN A CAN! I like it well enough. I did go back and make a better pot support that dramically increased the boil time and decreased the amount of wood fuel that was required to reach boil. I will try to remember and photo it on my next trip. And I decided that I usually do not have two extra tent pegs and it was easier to just use a myog gram weinie with a very short windscreen as a back up alc stove. It fits perfectly in my snowpeak 900 so it goes in an outside pocket on my pack and the soot/smoke smell is not a problem. I did not feel the need to make a fire on my last trip so it may have subliminally taken care of that desire. The smoke keeps skeeters away while I cook and that is a good thing. Its just a very simple to make, easy to use, fuel (weight) efficient way to cook. 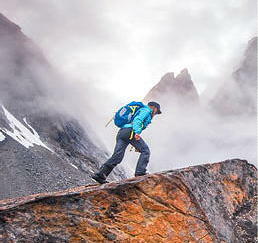 I could not imagine a long hike without one of these stoves in my pack. I used to think that if you were going to firecook then just do it on the coals - why carry around a stinky old bush stove? My mind is changed. 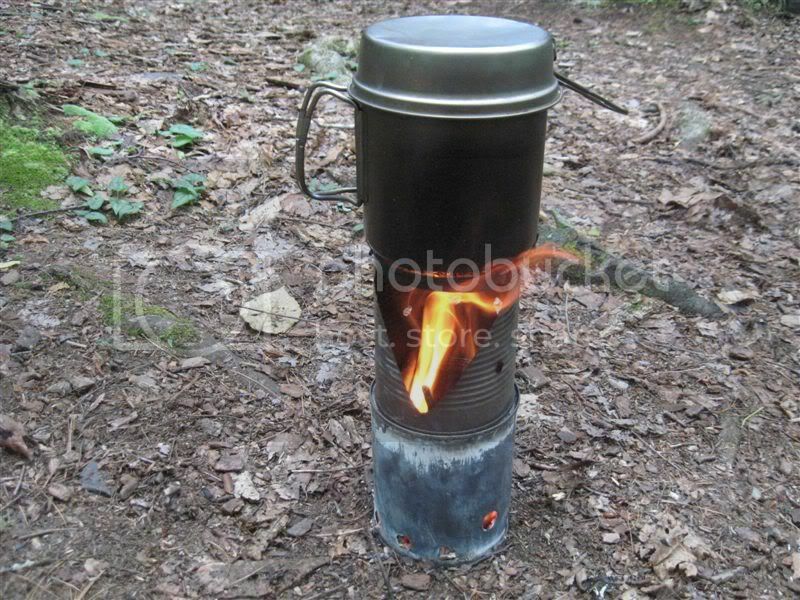 I never had a bush stove other than the Sierra Zip, and did not know the benefits. First of all, it is not that stinky, but it is sooty on the inside. A one gallon bag takes care of that. Secondly, it is the same principle as boiling water over an open fire to some extent - except that it does it in 1/4 the time with a lot less fuel and effort. And the best benefit is that for about 6 ounces I can cook as much as I want provided that conditions allow, ie rain. And to that extent it may be the limits of my fire building skills that determine when the bush stove stays in the pack and the alcohol stove comes out rather than a failure on the part of the bush stove. I'm digging this stove! Will definitely have to make/test one. Considering the weight of fuel saved, this appears to be a good tradeoff. It would give the youngster something to do while I set up camp - collect wood and get the fire going, something I would not let him do when cooking with volatile chemicals. Also could keep it going without "wasting" fuel, for additional cooking, roasting, etc. Q: what size pot will it fit in? i.e. overall dimensions? My name is J. Falk inventor of the Bushwhacker and Compact Wood Stove. I'm glad you enjoyed my stove design. I changed the design of the pot stand extenders, the original version had a few flaws. To see my latest version visit my "Compact Wood Stove" link at http://www.TrailGear.org then click the "Accessories" link. It's made from small paper clips and #6 x 1/2" sheet metal screws, this creates a stable pot stand. You'll need this when using an alcohol stove. You can also use it when burning wood. The pot stand extender creates an extra gap at the top of the stove which helps with venting the fumes.